I don’t know about you, but I can’t say breakfast is always exciting in my house. Sure, there are pancake Saturdays, strawberry streusel muffin Wednesdays, and sweet marrow custard Fridays, but there are also olive Thursdays. Yes, olive Thursdays, because the sun is up and I’m out of ideas. Until now. 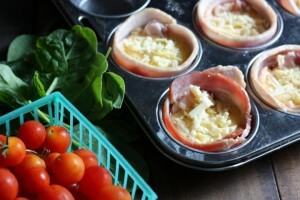 Recently I came across these bacon, egg and toast cups and was inspired to whip up a grain-free version. I was a little hesitant to try these, because in other versions I’d seen it was difficult to tell if the bacon was fully cooked. But they turned out amazing and the bacon was most definitely cooked through. The best part? They’re ridiculously easy to make. If you have opinionated eaters in your house, you’ll love that each cup is customizable – each person can add whatever filling they prefer. I love cherry tomatoes, cheese and spinach, while the potami prefer salami, mushroom and cheese. (You’ll find more filling ideas in the recipe below.) 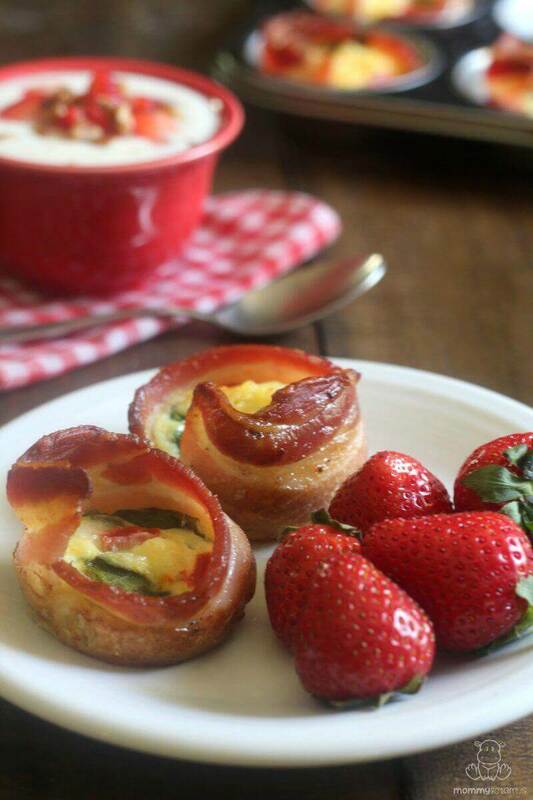 Wellness Mama has a ham and egg version of these on her site and also a fancier sous vide egg bite recipe. Also, I love that they’re portable. Because although it may be a great sensory experience, grabbing a fistful of scrambled eggs on our way out the door is not this mama’s idea of a great start to the morning. Thursday mornings have been saved, and very possibly a few “breakfast for dinner” weeknights as well. I hope your family loves them as much as ours. 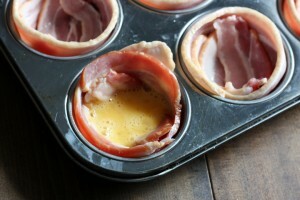 Simple and portable bacon and egg breakfast cups made in a muffin tin. 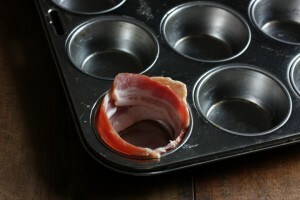 Grease 6 muffin tin wells, then line the walls of each well with a strip of bacon. Then cut one piece of bacon into thirds and use what you need to line the bottom as well. I usually put one full-width slice on the bottom, plus one I've cut in half . . . Continue the process until you run out of bacon. You should have 4 to 6 cups total. 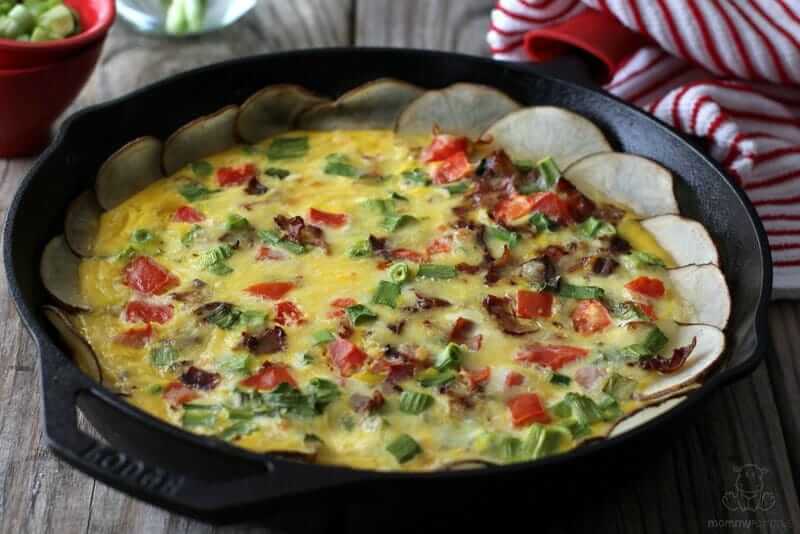 While the bacon is baking, whisk together the eggs in a small bowl and prepare the filling ingredients. 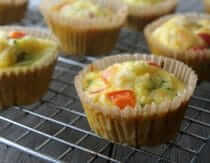 After 10 minutes, remove muffin pan from oven and distribute the eggs evenly between cups. Add in filling ingredients. You want the cups to be about 80% full. In this batch I added cheese, tomatoes, spinach, garlic, mushrooms and fresh thyme. 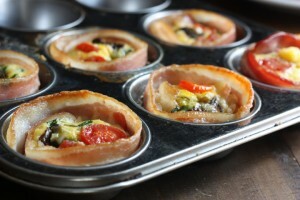 Place pan in the oven and bake for 25-30 minutes, or until the eggs are set. 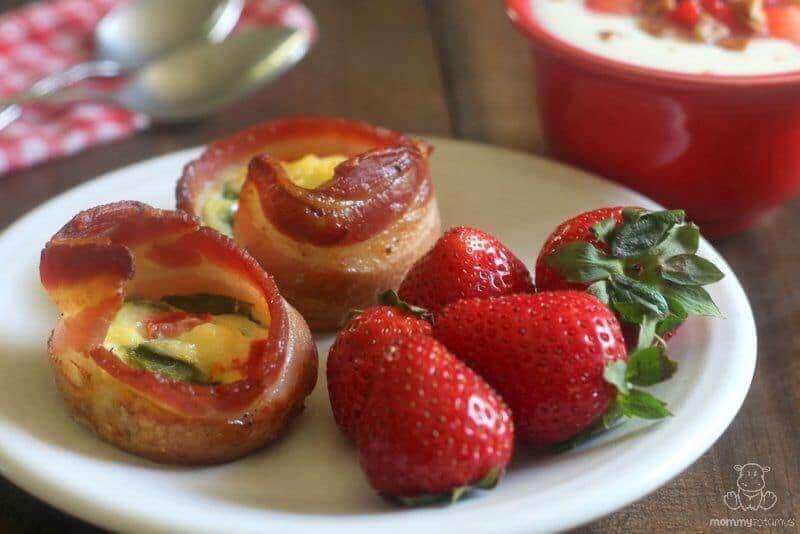 After you've removed the bacon egg cups from the oven, use a butter knife to gently separate the bacon shell from the muffin tin. 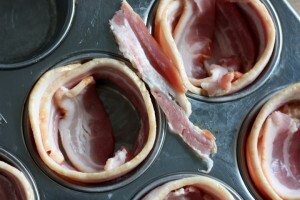 Lift the bacon egg cups out, season with salt and pepper, garnish with herbs if desired, and serve. 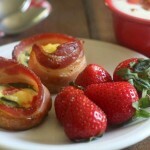 When I've made these the bacon is always fully cooked by 25-30 minutes. However, because it was baked rather than pan seared the surface is not caramelized we're used to. If you prefer the caramelized look, you can heat a skillet on high and roll the outside of the bacon cups in the skillet. Do you have a version of egg cups that you make? I’d love to hear about it! Thank you for this recipe. I’ve been wanting something my husband can reheat easily for his early mornings before I’m up, as well as Sunday mornings when we’re rushing to get out the door to church. This will be perfect and filling! Looks yummy! I can’t wait to try it!! You are hilarious! I love the humor you write with, whether it’s a recipe or important health fact. A dislike for eggs is the bane of my real food life…especially breakfast, obviously. I really want to like them, and have tried recently, but I just can’t (texture, taste, smell). Maybe bacon would help! 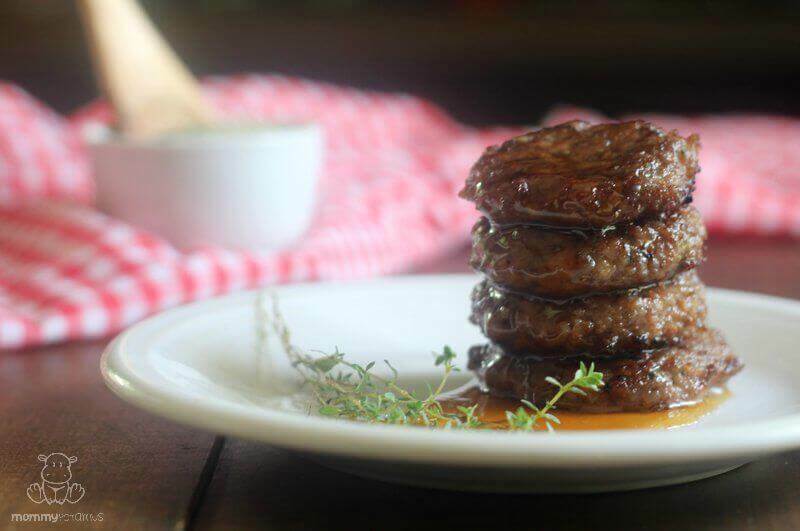 Can turkey bacon be used for these? Should these be packed with an ice pack for lunches for school? Have you tried freezing these? Does that work? Thanks! In general cooked eggs are soggy when frozen and thawed, so I haven’t tried it. Next Post What’s More Important: Food Or Sleep?